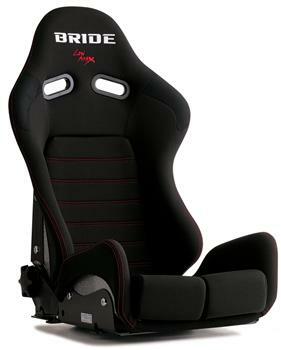 The BRIDE Low Max GIAS II Sport (gai-uhs) Reclining Seat is the newest full bucket seat. The new BRIDE GIAS II Sport Seat is armed with a reclining mechanism and the Low Max system. A new species of Holding Monster is born. The BRIDE GIAS II Sport tough frame was engineered using a super monocoque shell made from carbon-Kevlar and uses an all aluminum frame to increase rigidity for weight reduction. World-renowned professional racecar driver Keiichi Tsuchiya has only high praises for the battle capability and holding performance of the BRIDE GIAS II Sport Low Max Seat. The enhanced design is based on the idea that a high performance street car can also be used for the track, thus improving the versatility of the seat.